some LANDSCAPES: Nothing will take place, but the place. Nothing will take place, but the place. 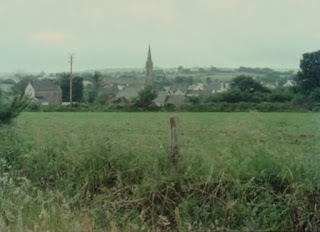 None of the landscape footage in the film is particularly picturesque, it just seems to record the countryside as the filmmakers found it. 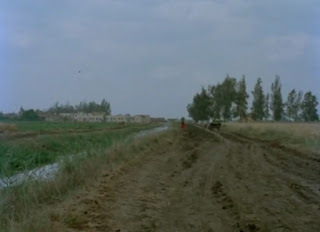 This unprepossessing muddy track, for example, appears just over an hour into the film, in the Egyptian section. The camera slowly pans across fields to this point and stays motionless for almost five minutes as a few figures pass, going about their business. The view is fixed. You cannot turn around to see what a noise off screen might be or look more closely at something in the foreground. As people slowly approach you are almost forced to wonder what brought them here at this particular moment, about their lives and the lives of everyone around them. The length, form and sequence of shots in the film seems almost arbitrary, so when this one ends at the point that an aeroplane can be heard overhead, you wonder if you should hear this as a symbol and a reminder that there is nothing 'timeless' in this view, or simply regard it as another chance element of the soundscape. The shot that follows this is another long take, this time from a vehicle travelling along a road. Watching this reminded me of recent experiments in slow television, although these have been much more glossy and set in landscapes with clear visual appeal. The rather grainy 16mm footage of Too Early, Too Late is sometimes reminiscent of Shoah, which I wrote about here last year. 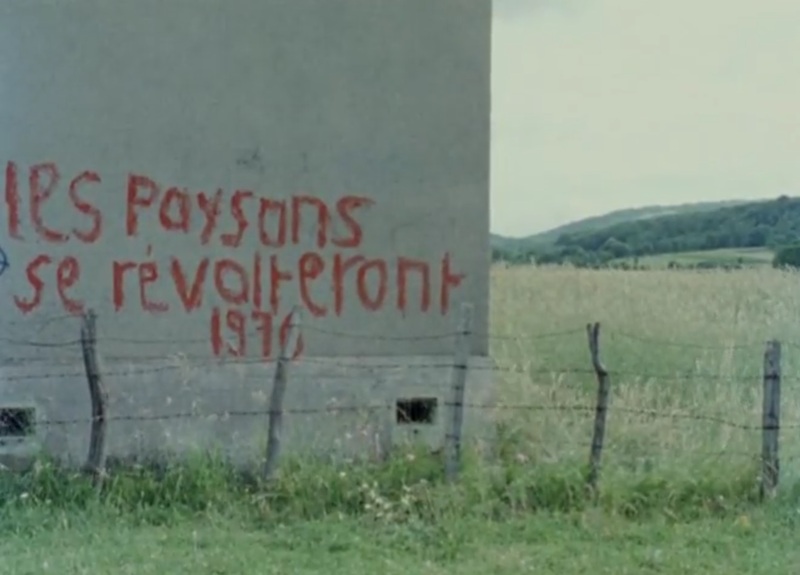 Landscape in these films has to convey authenticity, both in the moment of its filming and the political history it has passed through. 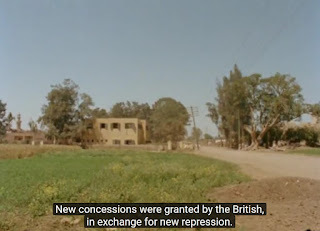 In 2011 Staub was interviewed during the Egyptian uprising, which seemed to add another layer of meaning to the film. The opening exchange does not auger well: 'Céline Condorelli: I only have three questions for you. Jean-Marie Straub: That’s very good, because I don’t have anything to say about this film.' However, Straub does have some interesting things to say, e.g. 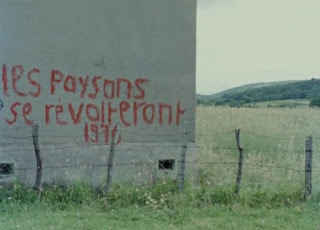 about the reasons for juxtaposing as 'a diptych' the French and Egyptian footage - 'to compare places that in France look deserted with places that in Egypt are full of life and people.' I will conclude here with three quotes from the interview, pertaining to landscape. CC: [...] How does one choose the appropriate position for the camera? JMS: That is the least one can do when filming…. You need to go there and walk around. Walk around a place or a village three times, and find the right topographic, strategic point. In a way that one may be able to see something, but without destroying the mystery of what one sees… but this isn’t specific to this film, this is the case in all our films. JMS: [...] There is an element of fiction, but it comes from the place itself. When you see a donkey passing by chance, and of course this only happened for one take, pulled with a rope by a man, with a woman sitting on it… of course this becomes mythological. Things like this cannot be anticipated, and are the gift of chance. But of course you need to have enough time, margins, and space for things like that to occur.